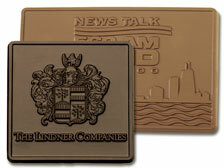 Gourmet chocolate bars engraved with your logo, promotional message or any other unique design! Your business associates, employees, friends and guests are sure to be highly impressed with such a gift. Each one of these 2” x 6” x 3/16” bars is packaged in a beautiful clear lid box. The candy bars are customized at no additional charge.